How we refreshed our brand to represent the sometimes intangible and unsung process of growth marketing. Five years ago we started Ammo with the idea of helping founders grow their startups into globally successful businesses. Breaking with the traditional creative agency do-and-charge project model, we wanted to work as a part of our customers’ team, in the trenches alongside ambitious startup visionaries. We have always had a relentless focus on results and metrics and combined that with an understanding of marketing new and unique products to real humans. Our original brand design was a geometric diamond, which spelled out ‘AMMO’ in the lines (something not many people ever noticed). Although an interesting design which was on-trend at the time, it didn’t mean much. We just thought it looked cool. Now that we’re growing up, we thought it was about time to refresh our visual brand with something which genuinely meant something and clearly communicated the promise we make to our customers. At Ammo, most of what we do to help startups grow is behind-the-scenes. The challenge in refreshing our own brand was finding a way to represent the sometimes intangible and unsung process of growth marketing. The breakthrough came when we recognised the common thread through all of our marketing efforts–measurement and experimentation. By focusing on the way data is visualised across various marketing platforms, we were able to create a brand identity that speaks to who we are and how we work with our partners. We created two mood boards based on our initial conversations about what we wanted from our new brand. These mood boards were divided into three columns. 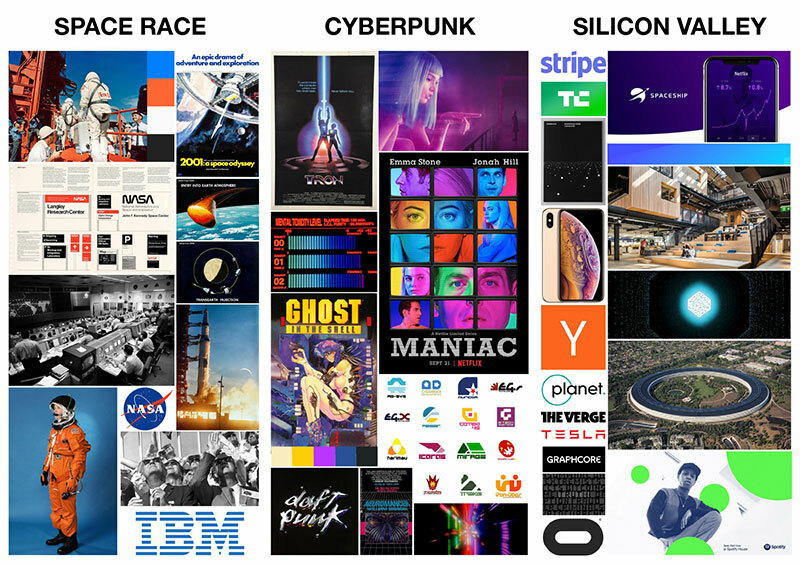 The first two columns were different visual motifs we liked, and the third was a column representing our ideal customers who had pulled from the same visual ideas. The goal here was to create something unique by combining the familiar in unexpected ways. By keeping the visual exploration focused on the macro rather than the micro, we left ourselves free to pursue whatever solution we needed within the broad brushstrokes of these mood boards. The Ammo logo has been simplified and refined to appear bold and engaging at a variety of sizes. The new typeface, Druk, has tall & narrow letterforms that allow the logo to effectively fill all of the digital spaces that a modern brand lives in. The logo has two versions, the type-only version is ideal for situations where the logo appears in isolation(profile pictures, business cards, etc.) 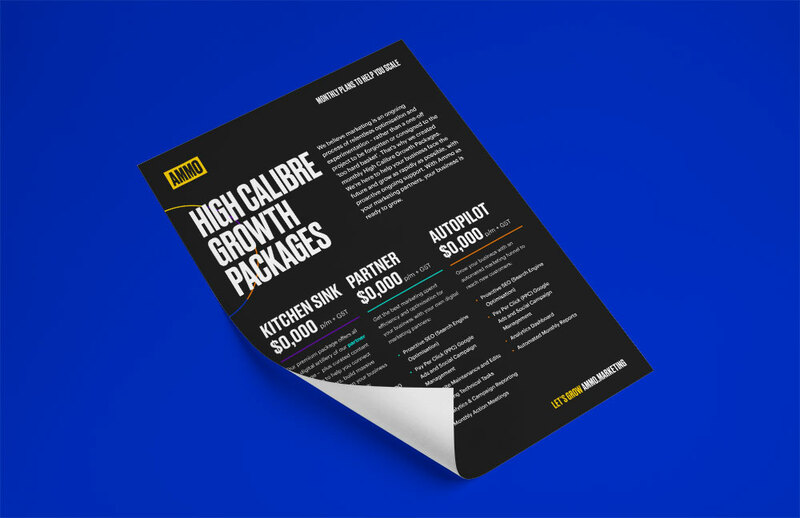 The box version is most effective in busier compositions such as brochures and websites, where it needs to stand out against text, images and icons. 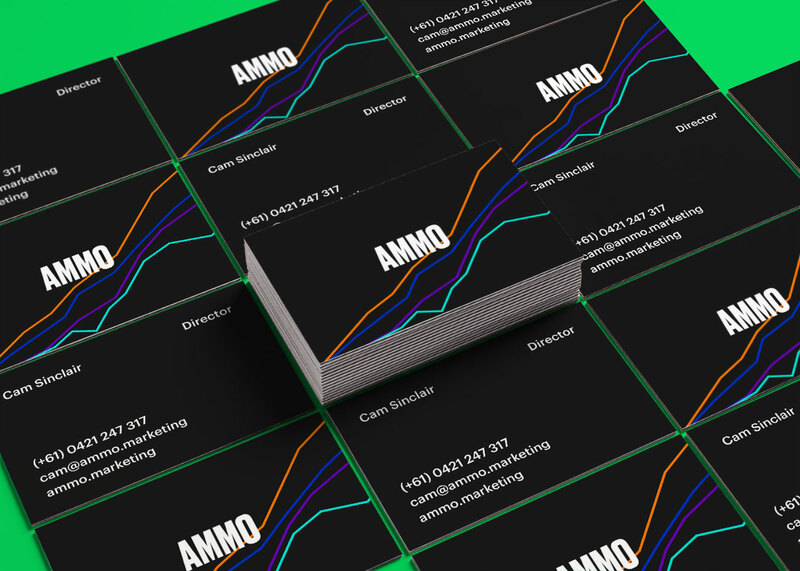 Combining analytics with creativity, Ammo’s new visual brand showcases the reason we exist - to help startups build to grow. 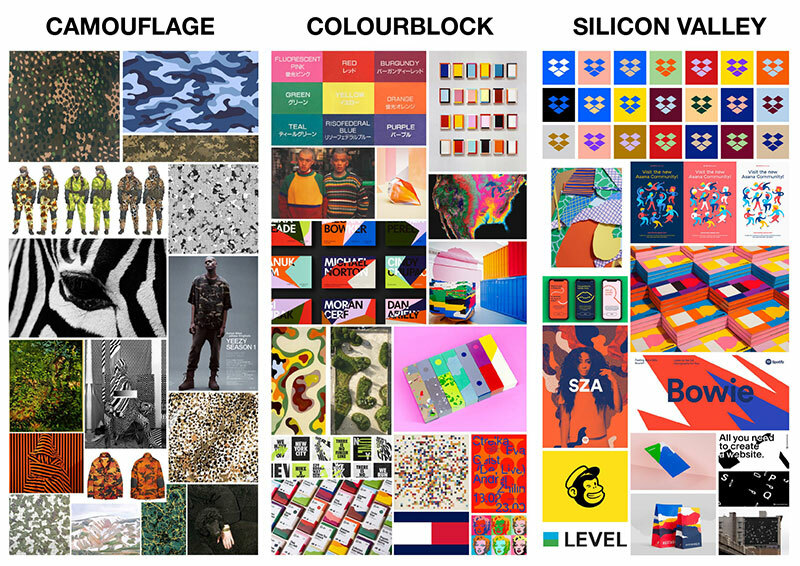 We created a flexible brand system built from abstract and colourful data visualisations that can shift and change to suit varied compositions across multiple mediums. This system allows for varied levels of expressiveness depending on need, with either monochrome designs or colourful and dynamic layouts. With our new and flexible brand, we can play it cool or cause a ruckus. 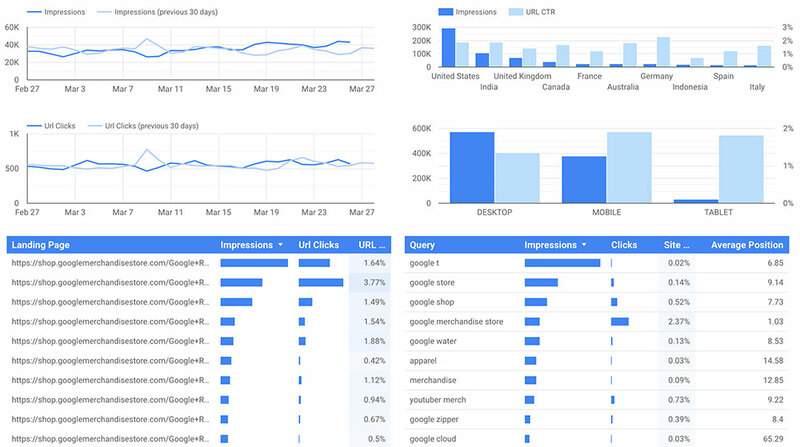 We selected a bright and vivid colour palette that stands out against black backgrounds, creating unique representations of graphs and charts used in analytics. Our logo can appear in any one of these colours, which gives us the flexibility to customise our materials depending on individual need. We can be selective about how much colour we use, when we’re the star of the show we can dial it up, but in customer focused work we can steer it towards the monochrome, so we don’t hog the spotlight. Druk and Graphik are the new Ammo fonts. We chose Druk because of its bold and impactful form, and Graphik because of its flexibility – Druk needed an unassuming sidekick. Druk’s for our most important headlines, the things we need to shout about, while Graphik supports it with secondary headings and body copy. Like any good brand, ours is designed to develop alongside our customers, our company, and growth marketing as an industry. 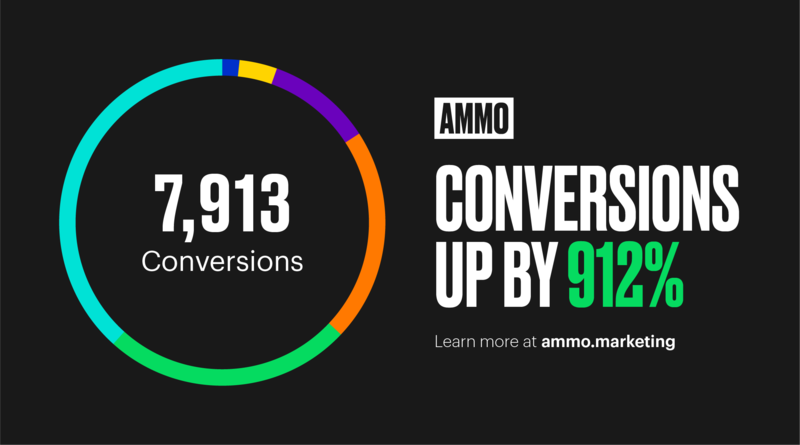 This is just the beginning — as the startup scene continues to grow, Ammo is excited to grow with it.